This chapter provides an overview of the crisis surrounding school safety in South Africa in general and in Mamelodi East in particular. It outlines a case study of the context and crisis in primary schools there, laying bare the brutal truth of bullying, vandalism, and gangsterism in these schools. Research into senior primary, high, and primary schools led to an empirical investigation which included interviews with school principals. This confirmed a reality that is being ignored: the current education system is in fact creating more opportunities for violence, bullying, and impoverishment. While resources such as the National Safety Programme exist, their translation into real measures and interventions remains questionable. Amongst other interventions, a more relevant Afrocentric curriculum and training for teachers is recommended. All stakeholders in education, community, home, and industry need to be held responsible for this dire situation and to take collective action. School safety is a critical and current concern in Mamelodi East, as elsewhere in the country. In this case study, we take you into the schools and community in this township, offering a snapshot of safety or lack thereof in primary, senior primary and secondary schools there. The safety problems in Mamelodi and the brutal truth of bulling, vandalism and gangsterism in the schools, is laid bare. To pin this study down, a desk-top literature review was firstly carried out by the writer categorising the research into senior primary, high and primary schools, before embarking on an empirical investigation. It is common knowledge that education researchers can improve school violence and school safety research by suggesting new directions for a translational science agenda that can inform policy and practice. Astor et al. (2010) discuss five key areas pertaining to school safety; a) A theoretical foundation for school violence research, b) Research on how policies influence school safety, c) Design and evaluation of evidence-based programs and practices, d) The need for translational research and, e) Building of monitoring systems as a foundation for translational science. Recent research efforts have focused on the design and evaluation of Evidence-Based Programs and Practices, however, in practice there are still many challenges to establishing a reliable evidence for school safety and school violence prevention. 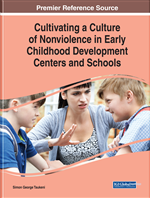 Current violence prevention approaches are embedded in psychoeducational programs, classroom and behavioural management programs, school-wide programs and youth development programs. The empirical investigation confirmed the reality in these schools. Principals or the safety committee educators were interviewed regarding their perception of school safety. Although the schools are well-built and maintained, teaching and learning might always not be of the quality that we hope it would be. This perpetuates the dysfunctional culture of the area. In our schools, instead of providing recreation facilities which are safe for learners to participate, the State, education and community are creating more situations and contexts for bullying, unemployment and impoverishment. The point of departure in this article is the assertion that as the context at hand is a South African township, the problem is the absence of more relevant Afrocentric curriculum and training for teachers. Likewise, other stakeholders, such as community, municipality, funders, parents and industry, need more awareness of the reality of township schools and the culture that prevails. In describing the background to the crisis, there are many factors which exacerbate the problem: social issues such as drug abuse; the lack of responsible citizens and good role models, and poor policy on safety, are some. All these cause vulnerable children to go astray. All these play a role in destroying their future. This chapter aims to raise awareness of the crisis around school safety in Mamelodi East, the gaps in addressing it and possible recourse. Recommendations spring to mind, with a call for action, which are summarised at the end of this chapter. National Safety Programme: The National School Safety Framework (NSSF) provides an important instrument through which minimum standards for safety at school can be established, implemented and monitored, and for which schools, districts, and provinces can be held accountable. The framework is premised on the assumption that each person in the school experiences safety in different ways, and has different safety needs, and it provides schools with the tools to identify what these experiences are, and the steps that need to be taken to address individual needs. Afrocentric Curriculum: Afrocentric curriculum is designed to empower peoples of the African diaspora. They should feel confident about themselves as human beings and express a positive identity and wellbeing. Teachers should teach with respect and compassion for the African heritage and include African children and their culture and languages in all teaching/learning. Many Africans have been subjugated by limiting their awareness of themselves and indoctrinating them with ideas that they are inferior. All learners should be treated equally, and the curriculum should encourage the optimal development of learners, whatever their color, creed, or context. Teachers should be retrained on “ubuntugogy” thus uplifting the teaching and learning in classrooms. It is suggested that universities and Departments of Education work collaboratively to formulate a democratic Afrocentric curriculum for the 21 st century.